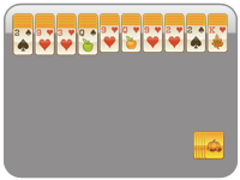 Cozy up with a warm beverage and solitaire on the weekend or during the week. Fall means back to school for students and time to get cozy in preparation for the winter months to come. 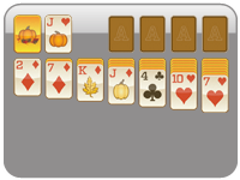 Take a break or multi-task with a game of Fall Solitaire! This game is the Fall version of One Card Klondike Solitaire. 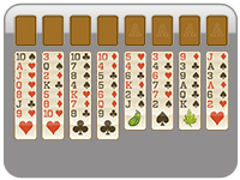 Place all of the cards into the four foundations at the top to beat this puzzle game. 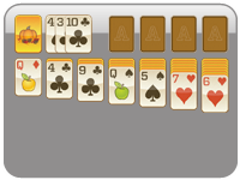 First, stack cards in the tableau in descending order and alternating card colors. 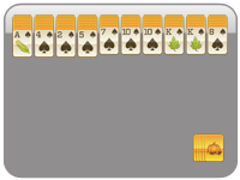 Then, move these cards to the foundation slots. 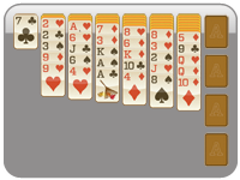 Make sure the cards in the foundation slots are of the same suit and in ascending order (Ace to King). Flip cards over one at a time from the top waste deck to add more cards into your playing game. Gear up for back to school by sharpening your mind with this fun strategy game and our eight others only on Fall Solitaire! Alternate colors when stacking within the tableau. Move the tableau cards to the four foundations. Order them based on suit. 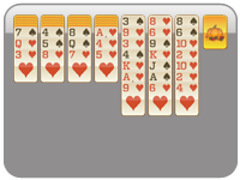 Win solitaire when you have put all cards into the four foundation slots.